Dr Katerina Strani led a working group on ‘Cross-cultural understandings of Race’ during the 14th ETMU Days conference themed Race, Power and Mobilities, which took place at the University of Jyväskylä, Finland on 26-27 October. The working group was put together to examine cross-cultural understandings of race in the context of increased mobility and migration. Minna Seikkula presented a paper on ‘The nexus between Anti-Racist Activists’ Conceptions of race/racism and migration’. Minna’s paper explored (dis)connections between racism and race/coloniality through an analysis of antiracist activists’ conceptions of racialized relations and practices in connection to migration. In Finland, as a part of the Nordic countries, speaking of racism often contains many paradoxes that are intensified by the current polarized political debate. For instance, Nordic self-perception is built on ideas of equality and democracy, while the eugenic pasts and their traces in the present are actively excluded from the grand narratives of the nation states. Race and racism are repeatedly seen relevant mainly or only in relation to migration, which can been seen to re-inforce the (false) image of white, homogeneous nation-states – yet, welfare state practices governing migration are often seen as neutral (or even anti-racist). Minna’s paper compared the views of activists reacting to heightened presence of the extreme right, as well as those demonstrating solidarity to newly arrived migrants and those articulating Black, Brown and Muslim identities. In the analysis, the focus was on the question of how racialized oppression is connected to or disconnected from the continuum of coloniality, which reproduces a world divided between west and the rest through racialized borders. The analysis is based on interview data with 47 antiracist activists in Finland. Next, Marta Padovan-Özdemir presented a paper written with Trine Øland on ‘Refugee Arrivals, Helping Hands and Hearts and Racialised Welfare Dynamics in Denmark, 1978-2016’. Marta and Trine’s abstract was as follows: “In the Summer of 2015, in all European welfare nation-states professionals, policy makers, administrators, and civil society organisations were in highest alert over the major refugee arrivals from Afghanistan, Syria, and the African continent. In Denmark, in particular, the government responded with stricter border controls and containment of refugees in temporary tent camps. Local administrative bodies and ngo’s contributed with panics about the managing of the new refugee groups. This state-of-alert is particularly interesting in a historical perspective of earlier Danish responses to the arrival of new refugee groups: The Afghans in the 2000s, the Bosnians in the 1990s, the Iranians in the early 1980s, the Vietnamese in the 1970s, the Jewish Poles in the late 1960s, the Hungarians in the 1950s, and not least, the Germans in 1945-46. The above-identified state-of-alert points to professional and civil confusion, disruption, and anxiety about not being able to manage a presumably new target group with the cultural repertoires already available. This state-of-alert crystallises welfare problematisations of the new target groups and becomes an occasion for the mobilisation of joint forces to manage and solve the imagined problems, thereby generating new tasks and needs for the helping hands and hearts. This paper’s objective is to gain insight into continuities and breaks in re-presentations of the refugee, and on that background understand the welfare dynamic, which is mobilized in response to the arrival of new refugee groups. The analysis builds upon critical studies of Danish welfare state developments and draws historical and analytical inspiration from Donzelot’s genealogies of the double pathologization inherent in welfare work. This is combined with Fanon’s underscoring of the racial order’s subtle expressions in postcolonial societies, which is supported by Said’s argument that re-presentation of the Other is the result of a willed human work. Finally, Katerina Strani presented her paper on ‘Exploring Cross-cultural Understandings on Race’. The concept of race, albeit controversial and disputed, is becoming more and more thematised in today’s multicultural societies, which are increasingly re-shaped by migration and changing demographics. These changes are bringing to the fore discussions on culture, belonging and otherness, with race being a central aspect of the latter. Starting from the premise that race is a social construct, Katerina’s paper looked at differences in the meaning, significance and difference in the construction of race and racialisation in different countries and cultures. The focus was on processes of exclusion and othering through racialisation and the hegemony of whiteness (cf Ahmed, 2007). It challenged the concepts of race and racism in the framework of migration nand mobility and urged the necessity to revisit these key concepts and seek definitions, clarifications and boundaries from people of colour themselves. The paper sought to establish a language to talk about race in a cross-cultural, changing and dynamic context without resorting to stereotypes, colourblindness or homogenisation of experiences. 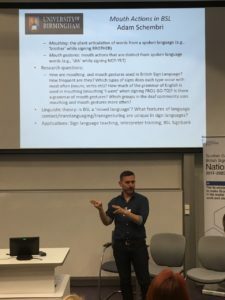 The presentations were followed by a lively discussion on definitions, boundaries and ‘white saviour’ complex, which included two of the three keynote speakers of the conference, Nando Sigona and Tobias Hübinette. Working group participants are grateful for all comments and interest in our research! 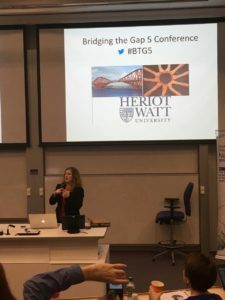 In the weekend of 25-26 November 2017, the fifth Bridging the Gap (BtG) conference was hosted at Heriot-Watt University. The aim of this conference series is to work towards bridging two gaps: first, the gap between academics (involved in Deaf Studies and sign language research) and deaf community members; and second, the gap between deaf and hearing academics within these fields. 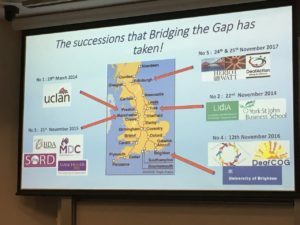 While the second gap triggered the organisation of the first BtG conference in 2014, the fifth iteration of the conference mostly focused on the gap between community members and academics. 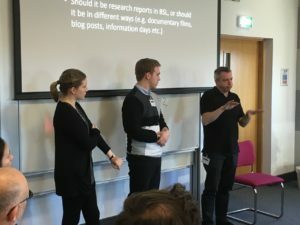 It was the first time that BtG lasted two days rather than one, and it attracted 120 participants: community members and academics hailing from all over the UK, the largest audience so far. The conference was heavily discussed on social media, particularly on Twitter (see #BTG5). 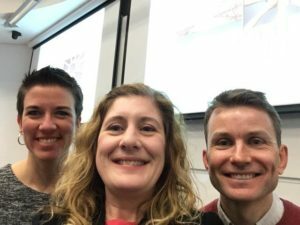 The core organising committee consisted of Jemina Napier, Jordan Fenlon and Annelies Kusters, and others who have worked with us to plan the conference included Steve Emery, Dai O’Brien, Heather Mole and Emmy Kauling, and a number of student volunteers. The conference started off with an introduction by Nicola Nunn, who organised the first BtG conference in Preston. She introduced the BtG series, emphasising that she was very happy to see that the conference was not an one-off and is now an established one in the British deaf conference landscape. 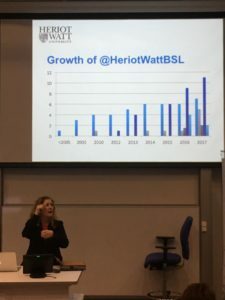 After Nicola, Jemina Napier took the stage to give the audience an impression of the kind of research and community work we are doing here at Heriot-Watt, where the BSL section has recently exponentially grown. 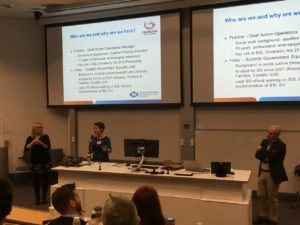 After opening the conference in this way, Hillary Third (Equality Unit, Scottish Government) and Frankie McLean (Deaf Action) gave a keynote presentation focusing on the implementation of the BSL (Scotland) Act. Hillary and Frankie explained that the aim of the Act is to make “Scotland the best place in the world for BSL users to live, work and visit”. 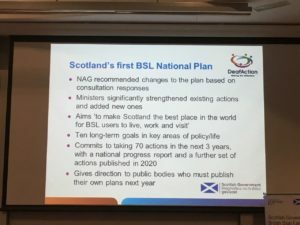 The BSL National Plan for 2017-2023 contains 10 long-term goals and 70 actions in the next 3 years (covering early years and education training and work; health; culture and the arts; transport; justice and democracy) and a further set of actions will be published in 2020. 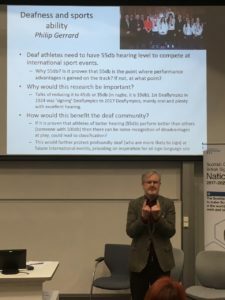 The Plan was constituted after extensive consultation: the National Advisory Group (NAG) has been successful in engaging large numbers of Scottish deaf people in the BSL Act. Not only was the NAG a great input for the Scottish Government, it also served as an instrument of empowerment. Several feeder NAGs such as a parent and youth NAG had input into the general NAG. An inspiring video was shown of 2 deaf teenagers who were involved in the youth NAG, talking about the valuable experience of being involved, since they “are the future”. The Act is a great example of working with and for a deaf community in order to create better life conditions for deaf people. This opening session was livestreamed (https://www.facebook.com/HWUBSL/). When we were planning BtG5, we already knew during our first meeting that we didn’t want to organise a “typical” conference consisting of presentations to disseminate research findings. Indeed we thought that if we really wanted to work towards bridging a gap, we would need an interactive format, designed in order for people to be able to express a range of thoughts on the “gap” under discussion. So the three sessions that followed the keynote presentation were interactive. 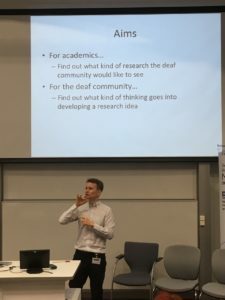 The aim of this panel was for academics to learn about what kind of research deaf people find important and for the audience to get insight in the kind of thinking that’s involved in crafting a research proposal. Panelists for example pointed out the need to use buzzwords such as Thomas Lichy’s use of the word “hate crime”. They also pointed out that sometimes similar or related research has already happened (the dementia proposal); or that an idea (the deprivation project) had been previously pitched but not in a successful way. They said that a project such as the BSL corpus project would preserve old signs and regional variations, but a funder would require it to contribute to new academic theory, which is often a big challenge in applied projects. 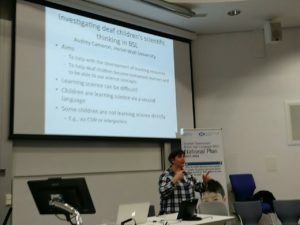 The idea that won the audience vote was Audrey Cameron’s: she suggested to work with Science Centres to give science teaching tessions to deaf children in BSL, and study how we think about science in sign language: a wonderful combination of doing exciting research in combination with direct benefits for deaf children. 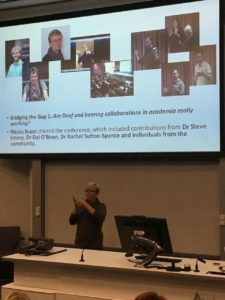 The panel consisted of academics and community representatives: Bencie Woll, Terry Riley, Graham Turner, Gordon Hay and Emma Ferguson-Coleman. 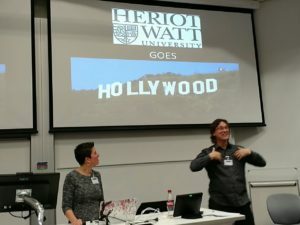 The second interactive session was called “Heriot Watt goes to Hollywood”, facilitated by Annelies Kusters and Gary Quinn, in which 6 short films were showed that were created by Heriot-Watt BSL section staff, PhD students, postdocs, BSL students and community members. The issues included: deaf people not learning about research findings after a project is concluded; having to sign epic consent forms in English; working with interpreters during research projects; the fact that participants often don’t want to admit when they need more clarificaton from academics; deaf people not knowing about Deaf Studies concepts but hearing interpreter students do, which can intimidate deaf people; deaf academics “leaving the community behind” to give presentations at international conferences and publish books. With the films, we tried to tackle issues in a humorous albeit serious way. 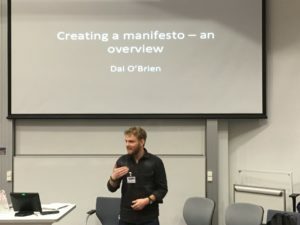 The Hollywood session led to lively discussions, and during the next session on the next day, a manifesto workshop was facilitated by Dai O’Brien, Jordan Fenlon and Annelies Kusters, in order to address the same issues with the aim of taking action in the shape of a manifesto. Everyone got involved, the discussions were recorded, and Dai, Jordan and Annelies will take this forward. They will summarise the videos and use the summary to create a first rough draft of the manifesto which will then be presented and further discussed during the next BtG conference. Some issues that were discussed during the Hollywood and manifesto sessions included: how are research findings made accessible and attractive for community members? In the case of participants who directly contributed to a research project, it is important to ask how they want access to the findings, eg. some might want a summary in BSL and others might want the full article in English. In case of the broader community there are a number of options. Who wants to watch a two hour signed report on academic topics? Other options include short signed summaries, documentary films, interactive websites and texts in plain English. It is important to make research meaningful and interesting, and that also often means that reports should be kept short. When giving live presentations, it’s important to consider where the event is hosted: a relaxing/safe space such as a trusted deaf club with a pint in the hand, or pizza in a chilled out place, fosters a very different kind of atmosphere than an university auditorium. 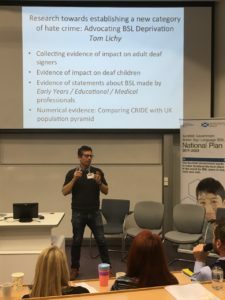 An issue that surfaced multiple times during the conference is that researchers are increasingly proactive in trying to make their research accessible in BSL but members of the deaf community might not know the BSL report exists (such as the earlier mentioned dementia project). 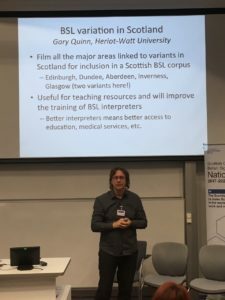 So, how can people learn what research is happening and where, and where can they find it? The clever use of hashtags and Facebook groups is one means but it was also suggested that a centralised website with a “research map” would be helpful. It is not clear yet where the 2018 iteration of BtG will be organised. We hope that during the next BtG conference, we can discuss actual examples of “good practice” in research and community involvement and impact, and how these might inform the BtG Manifesto. Studying languages : wise or unwise ? Conflicting information has recently been released in the press over the career benefits of studying languages, with the Telegraph grabbing headings with a bold statement according to which “Languages graduates are now the least employable in Britain”, according to an ONS survey, while the BBC published data from the Institute for Fiscal Studies, which place language graduates above medicine, business and law graduates in terms of earnings. The CBI’s reports on employment skills sought after by employers have also repeatedly stressed the importance and benefits of languages in terms of employability, highlighting that despite the looming prospect of Brexit, “there can be great advantages for British businesses if employees can communicate with at least reasonable proficiency in the language of clients, customers and suppliers”. According to the same study, EU languages are still very much in demand: businesses surveyed have stressed the need for “French (50%), German (47%) and Spanish (30%)”, showing clearly that linguistic skills remain prevalent, not to mention the communication skills and intercultural awareness that goes hand-in-hand with the study of languages. So who to trust? Should you still consider that language degree, or is it a waste of time and money? Worthy question, particularly relevant in England and Wales when you consider the financial cost of higher education studies. When you are considering paying up to £9,250 a year in tuition fees (caped amount for undergraduate degrees in England), of course, employability becomes a significant factor in your choice of studies. Part of the answer could possibly be found in the type of studies linguists choose, if we consider the case of Heriot-Watt University graduates: the Languages and Intercultural Studies department (known as LINCS) offers degrees with a very clear professional focus. In keeping with the ethos of Heriot-Watt University, students who come to do a degree in languages … don’t actually do a degree in languages! They do degrees in translation, in interpreting, or focus on an applied use of languages for business. So languages are considered as a field of expertise studied for specific, applied purposes, and students get to grips with very professional uses of the language: how to handle interpreting in a business meeting, how to prepare to interpret simultaneously at an international conference, how to master key CAT (computer-aided translation) tools … and rather than the more traditional and philological approach still noted in more traditional language degrees, Heriot-Watt LINCS students don’t study literature: they focus on developing their understanding and knowledge of modern-day Spain, France, Germany, China, etc … They learn about the way institutions work, what education systems are like in each countries, how politics currently stand in each area, and they study international organisations, business strategies and cultural-specific approaches to corporate management. Another key aspect of LINCS training is the connection with the industry, another crucial element stressed by the CBI in their report. LINCS works closely with Heriot-Watt University’s Career Services, running regular and innovative information sessions with inspirational speakers from around the world who studied on the degree programmes offered by the department, sometimes using e-communication tools to ensure that students get a chance to speak to talented professionals living and working in distant locations. Students also have access to mentoring schemes, career fairs and tailored support; they receive guidance and advice throughout their studies, and they’re all included in a LINCS-specific mailing list designed to flag internship, volunteering and paid work opportunities. So don’t be fooled by headlines: a focused, applied language degree is still very relevant. It will give you a very versatile and highly employable profile, and it could make you richer than a lawyer! The Centre for Translation & Interpreting Studies in Scotland (CTISS) at Heriot-Watt University in Edinburgh is delighted to announce an international conference on Translation and interpreting in an era of demographic and technological change, to be held in Edinburgh on 30 and 31 May 2018. Open to all, the conference immediately follows the members-only General Assembly of CIUTI (Conférence Internationale Permanente d’Instituts Universitaires de Traducteurs et Interprètes) and is intended to create a common space for reflection on translation and interpreting issues. The conference language is English. The digital era, characterized by technology which increases the speed and breadth of knowledge turnover within the economy and society, now embraces every aspect of our lives. The impact of new technologies is changing the very nature of language and communication, causing adjustment in every aspect of who says what, to whom, how, why, and with what effect. These developments interact in increasingly complex, pivotal and pervasive ways with demographic shifts, caused by war, economic globalisation, changing social structures and patterns of mobility, environmental crises, and other factors. Translators and interpreters attempt to keep up with these shifts. This conference is designed to reflect upon the innovations in research, practice and training that are associated with this turbulent landscape. Submissions are invited for 20-minute presentations. Abstracts should be no more than 400 words (excluding references) and clearly state research questions, approach, method, data and (expected) results. Please submit your abstract as a file attachment including the title of the paper, author name, affiliation and e-mail address to CIUTIconference2018@hw.ac.uk. The subject header of the submission email should read: Abstract CIUTI. Edinburgh is the capital city of Scotland, the home of the Scottish Parliament and well served by international communication and transport links. The University was established in 1821 as the world’s first mechanics’ institute, with its Royal Charter granted in 1966). It is ranked among the World’s top 500 and the UK’s top 30 universities. The Centre for Translation & Interpreting Studies in Scotland (CTISS) is internationally renowned for the calibre of its research which has been developed over more than 40 years. Bringing together research expertise across disciplines in translation studies, interpreting and applied language studies, the Centre’s work – building a diverse and coherent body of knowledge which seeks to address socially-relevant issues – informs the thinking of government, industry and public bodies around the world.